Review by AllTheBestFights.com: 2018-11-03, good exchanges between Ryan Burnett and Nonito Donaire: it gets three stars. The undefeated former Ibf and current Wba Bw champion Ryan Burnett entered this fight with a perfect boxing record of 19-0-0 (9 knockouts) and he is ranked as the No.3 bantamweight in the world (currently the #1 in this division is Luis Nery). In his last three bouts he has won over Lee Haskins (Haskins vs Burnett), Zhanat Zhakiyanov (Ryan Burnett vs Zhanat Zhakiyanov) and Yonfrez Parejo (Ryan Burnett vs Yonfrez Parejo). His opponent, the former world champion in three different weight classes Nonito Donaire, has an official record of 38-5-0 (24 knockouts) and he entered as the No.10 featherweight but he lost two out of his last three fights, against Jessie Magdaleno in 2016 (controversial decision, Donaire vs Magdaleno) and Carl Frampton in 2018 (Carl Frampton vs Nonito Donaire); between these two bouts he beat Ruben Garcia Hernandez in 2017 (Nonito Donaire vs Ruben Garcia Hernandez). 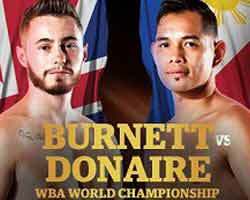 Burnett vs Donaire is the quarter-final of the World Boxing Super Series bantamweight tournament (WBSS – Muhammad Ali Trophy) and it is valid for the WBA and WBC Diamond bantamweight titles; undercard of Josh Taylor vs Ryan Martin. Watch the video and rate this fight!